Regular visitors will be aware that we've been getting a bit of a bee in our bonnet about the title changes that some lesser known foreign language and even American genre films have being getting for their UK DVD releases in recent months. We've barely caught our breath back from the last lot when another arrives in our intray in the shape of Dawn of Evil – Rise of the Reich, a potboiler title for a 2009 German feature whose actual title is Mein Kampf. Recognise that one? The book written by a certain Adolf Hitler during his short stay in prison in which the future dictator combined autobiography with an outline of his political philosophy. Famous enough, you'd think, to effectively sell the film outside of its home shores. But no. Dawn of Evil – Rise of the Reich. I'll let the press release outline the plot. I wonder what happens next? Opinion has been split on the film's gameplaying with the truth, but there has been plenty of praise for Tom Schilling's central performance TV and documentary director Urs Odermatt's technical handling. 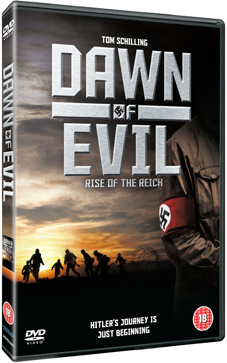 Mein Kampf– oh all right, Dawn of Evil – Rise of the Reich – will be released on UK DVD by Revolver Entertainment. No extras have been mentioned.